Giving Tuesday, December 2, is a national 24-hour giving event to support worthy causes amid the rush of Black Friday and Cyber Monday. Friday from 12 to 3 PM you can look for Loving Garland Green members to be selling Cups of Texas and Sacks of Texas down in the Garland Community Garden located at 4022 Naaman School Road. No two cups and no two sacks will be the same. The Cups of Texas are priced at $3.00 each. Where can you find a holiday gift these days for $3.00? The sacks of pecans are being sold at $1.00 a sack--a perfect stocking stuffer. Yep that's right! Members of Loving Garland Green will be ringing the bells and dancing at Brand and Naaman School Road. Building a local plant-based economy: one plant at a time. 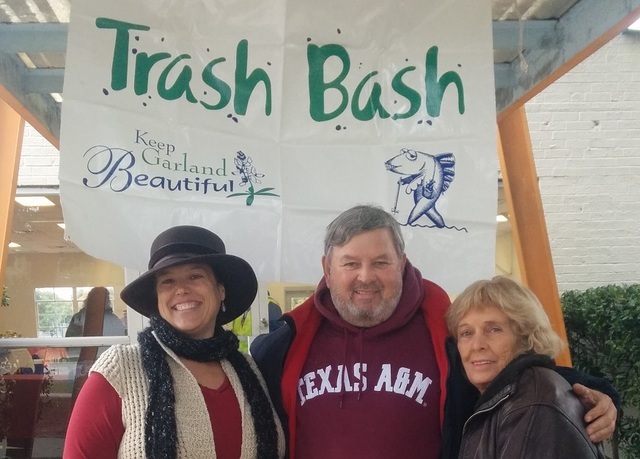 Loving Garland Green Board officers and board members: Carol Garrison, Charles Bevilacqua, and Liz Berry at Keep Garland Beautiful's Annual Trash Bash - November 2014. Carol Garrison and Daniel Bell with their worm farm at a Garland elementary school. Education and learning with the community regarding the value of organic urban local food production and all its related activities such as rainwater harvesting, vermicomposting, and increasing our knowledge regarding permaculture principles are central to our activities. Yes, Loving Garland Green is the group whose members are the official stewards of the only community garden on City property in Garland Texas. The Garland Community Garden is located at 4022 Naaman School Road (at the intersection of Brand and Naaman School Road). However, being stewards for our Garland Community Garden is only part of our community activities. We participate and support many community events. We currently have over 1,500 square feet of garden beds down at the garden and plan to add 640 square feed before the end of the year. As for perennials, we have nine blackberry bushes, four blueberry bushes, two rosemary bushes, one fig tree, one pomegranate, three grapevines, one Santa Hoja, and numerous self-seeding annuals installed at the garden. 2. Add soil amendments to all the existing beds (about 500 square feet). Note: after completion of the second row of beds in the Winding Garden, we will have approximately 1,200 square feet of garden plots. 3.Design a rainwater harvesting system for the garden that will make it self-sufficient for at least 50% of its watering needs by the end of 2015. In Garland we have an annual rainfall of 38 inches. If our community had the proper rainwater harvesting systems installed throughout our municipality, we would not need to ration water. In the process of doing this, and in fact all our projects, we want to involve the local residents and learn together with them. One thing to remember about Loving Garland Green is that none of us consider ourselves as "experts." We are all learning together and sharing our knowledge as we gain it among ourselves and with our community. 4. 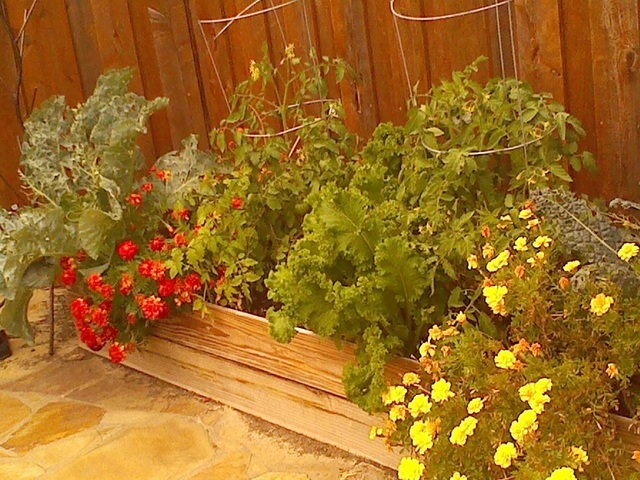 Begin installing urban gardens in the homes of Garland residents at the rate of 2 a month starting in January of 2015. 5. Design and establish a program that will enable us to build at least two tiny homes on a lot here in Garland. These two homes would, of course, share a common garden. 6. Launch a program to support neighborhoods in building neighborhood community gardens. We know the closer a resident lives to a community garden, the more likely they are to participate in taking care of that garden. NOTE: Our viewpoint of the community garden is somewhat different as we view the community garden as an experiment for people to learn about gardening and related "green things" such as composting and rainwater harvesting together. It is not simply a place where people rent a plot, and plant some vegetables. It is a place to learn about growing edibles by growing them. It is a community of people learning together and fully exploring all the possibilities that growing food locally offers for our community. All our members also have gardens at their homes. 7. Speaking of experiments, one of several that we are planning for 2015 is the Loofah and Hops Growing Adventure. We already know that we can grow loofahs in the garden as we produced no less than 20 without even trying hard. Loofahs, a type of squash that grows into a large fibrous sponge has commercial value in our community--that we also proved in 2014. In September at our local Marketplace on the Square, we sold 24 of them (6 cut into four pieces) at $2.00 each. We could have sold more if we had more. As for Hops, we are still doing research on the types we will plant. However, with the rise of craft breweries, we think there may be a market for hops in our community as well. Prior to 1941, we were a creditor nation with a national plant-based economy. After 1941 we began to move into the era of an oil-based economy. We forget that we can do everything and more with a plant-based economy than we can with an oil-based economy--including making plastics. In the late 1930's, Ford chemists developed a material that consisted of 70% celluose fiber and 30% resin. The cellulose fiber consisted of 50% southern slash pine fiber, 30% straw, 10% hemp, and 10% ramie. They used this plastic to create a car. The plastic material of this car could absorb blows ten times as great as steel without denting. Ford even demonstrated this by having men try to dent the vehicle with large sledgehammers. I would like to see a company begin to create plant-based plastics today. If we used hemp and fast growing bamboo, we would not have to worry about depleting our forests. Let's start rebuilding our economy locally--one plant at a time. Start experimenting in your own back yard. 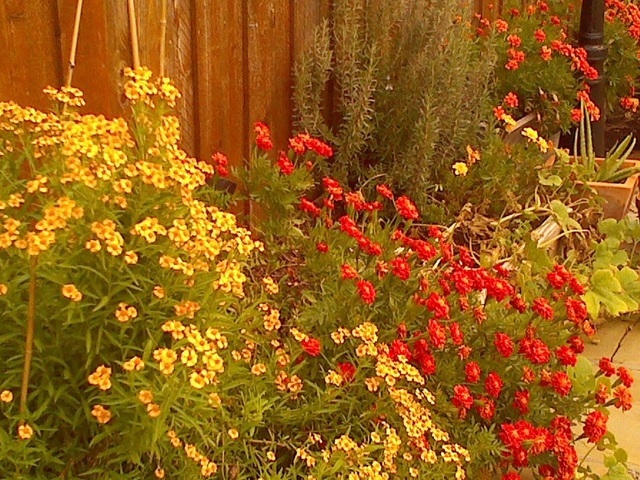 You may be surprised at the amount of plants you can grow. Growing plants is the next revolution and it has begun. Growing your own food is the fast track to freedom. Stop looking for solutions to come out of Washington and start working with your local government to create a plant-based sustainable prosperity right where you live. Join Loving Garland Green and learn with us--how to grow plants and how to participate in your local economy and local government. Yes, you can do it by yourself, but friends will get you there faster. We meet every Monday from 6:30 to 7:30pm at 216 East Kingsbridge Drive Garland 75040. Add Wood Ash to Compost ONLY IF you do not plan to mix your compost into existing clay soil here in Dallas county. It is that time of year: What to do with the ashes in the fireplace? I'm putting mine in my compost and in the compost bins at the Garland Community Garden. Wood ash (not coal ash) is a great addition to garden soil. It contains potassium--a vital nutrient for plants. I can do this because the soil I use for my garden and the Garland Community Garden is all made from organic materials put on top of cardboard to create raised garden bed mounds. It is not mixed into the existing Dallas County clay. 1. 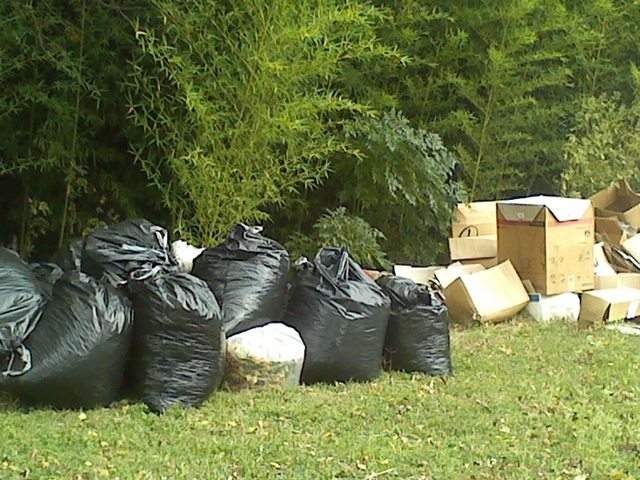 If you plan to work your compost into the existing clay soil in Dallas county, do not add wood ash to your compost as it will toxify your soil. The soil in Dallas county is black clay, highly alkaline and with very high levels of Phosphorus and Potassium. 2. Don't dump several gallons of wood ash all at once to your compost bin because if you raise the pH too much, you will upset the balance of bacteria and worms. Wood ash is really good to keep your compost in balance if you compost a lot of fruit and other acidic organic matter. Hellebore, a perennial flowering plant, comes in lots of colors and heights ranging from just 2 inches to 2 feet. They are frost resistant, shade tolerant and bloom in the winter and early spring. Many varieties are evergreen. Great Garden Plants have quite a selection of Hellebores for purchase. Cyclamen (23 species of perennials) Zones 5 to 9. These late winter bloomers prefer partial shade.Cyclamens have a tuber, from which the flowers and roots grow. 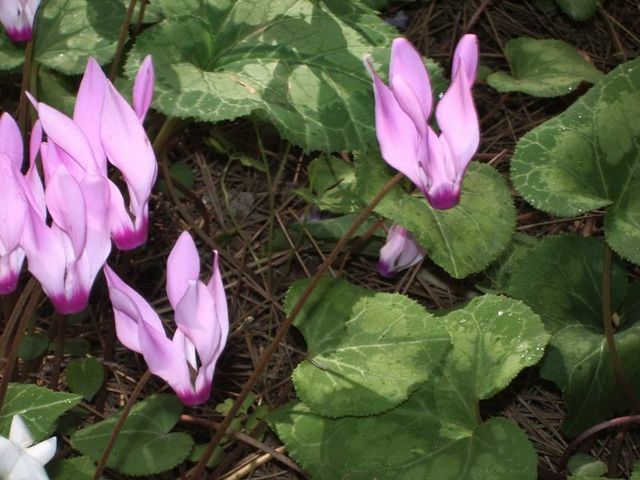 In most species, leaves come up in autumn, grow through the winter, and die in spring, then the plant goes dormant through the dry summer.Cyclamen persicum and coum bloom in winter. They are the most cold tolerant of all Cyclamens. You can find these plants in most nurseries in the area now. 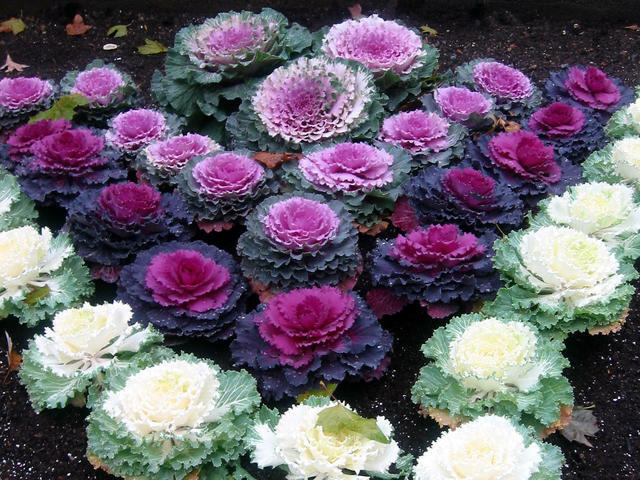 Ornamental cabbage - The lower the temperature, the more vivid the colors. This plant loves the full sun. You can still find this plant in most nurseries in and about Dallas. Green Tomatoes Everywhere! -a view from my kitchen table this morning. 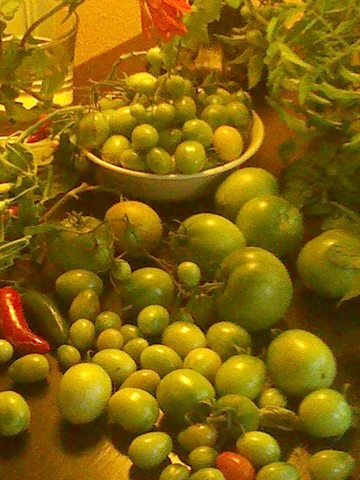 Signs of the Coming Winter: Green Tomatoes in my Kitchen . . .
No "hard freeze" yesterday in Garland. Even so with a 32 degree reading in Garland at 6 am today, I was glad to have taken the precautions I did--covering my plants with leaves and blankets and digging up all my artichokes and bringing them, along with an orange a lemon tree, into my home. it was a good fire drill for me as tonight the weatherman is predicting a hard freeze for our area. 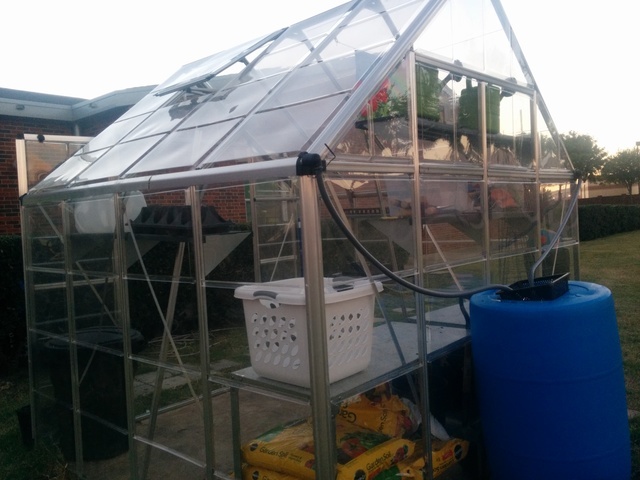 The more experienced gardeners in Loving Garland Green's membership, such as Carol and Daniel, have built protective enclosures around their tomato plants. These gardeners will be picking fresh tomatoes from their garden throughout the winter. The johnny-come-latelys to the garden scene such as I are content to gather in our green tomatoes before the hard freeze. Indeed, I'm glad to even have some tomatoes to gather. Now the question becomes: What shall I do with this nutritious food source? I've decided to do three things: 1) Keep some on the vine and stick the vine in water with a few nutrients in it to see if they will continue to mature. 2) Just leave some in a sack on the table to ripen. 3) Cook the rest. If you visit the Internet and search for ways to ripen green tomatoes, you'll find all kinds of interesting instructions. Several methods suggest that putting a banana in with the tomatoes in the bag will speed things along. I was a little surprised that most of the methods suggest to ripen tomatoes in either a plastic or paper bag in a warm dry space out of the sun. Left to following Charlie's method, I would have simply put them on the kitchen table in the sun to ripen. They will ripen if you do this. I know because I've seen it happen many times. 1. Preheat oven to 350 F. Grease a 9-inch by 13 inch glass pan. 2. Slice tomatoes 1/2 inch thick. Sprinkle lightly with salt and pepper. 4.Beat the green tomato slices by dipping them int he coating ingredients in the following order: milk, flower, egg, bread crumbs. 5. Fry each slicks 4 to 5 minutes per side. 6. Place in a single layer to cover the bottom of the baking pan. 7. Cover tomato slicers evenly with tomato sauce. 9. Bake 45 to 60 minutes or until tomatoes are done to your liking. 10 Serve hot on freshly cooked pasta. And then there is the promise of more tomatoes next year. . .
Down at the Garland Community Garden we are beginning our annual fall collection of leaves, paper and cardboard boxes--materials that we use to create lasagna beds, mound style. In addition to amending the soil in the first section of The Winding Garden section, in late December we will begin construction on the second row of these garden plots. Section I is approximately 160 feet long and about three feet wide. Section II will be about the same. Each section is divided and numbered into 24 plots. Visit our website at Loving Garland Green, or better yet attend one of our weekly meetings at 216 East Kingsbridge Drive Garland Texas 75040. We meet every Monday from 6:30 to 7:30. The Garland Youth Council engineered the creation of a public blackboard on the State Street side of the Garland Civic Theatre building at the corner of Fifth. Lucas Cervellini, a Garland resident who formerly taught art in Argentina, was the first artist to display his work on the blackboard. Like life, the public blackboard will be in constant transition as various forms of nature, including human beings and the weather interact with its surface. 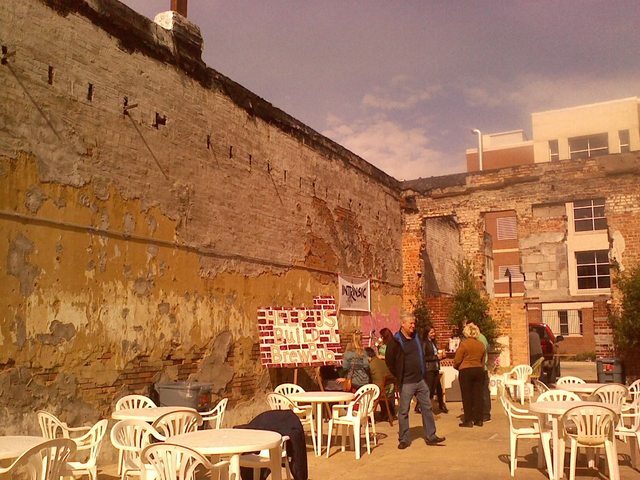 The grassy space on the vacant lot that adjoins the blackboard will provide more space for the Saturday night gathering of musicians on the square. And who do you think took this great photo of Lucas drawing on the blackboard? It was none other than our Mayor Doug Athas. 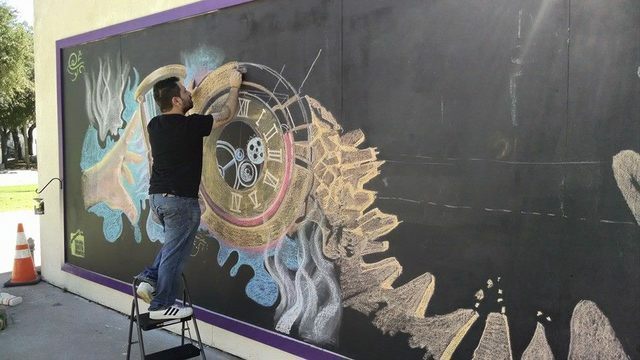 If you are one of the many local Garland artists or artist wantobes, get on downtown and create your own work of art on this blackboard, but make sure to take a photo of it before you leave. Start participating in your community now. Love your place so that others can see how special it is. Love is a magic that grows all kinds of beautiful gardens in the most unexpected places. Speaking of Love and Loving Your Place and Supporting Your Community. . . Remember to dine at the Firewheel Chipotle on Tuesday November 18 between 6 and 8 pm on Tuesday. Tell the servers that you are there for the fundraiser and 50% of the price of your meal will go to the Garland Youth Council. The mission of the City's Youth Council is to provide a forum which educates Garland's youth to the various workings of City business and allows youth to be a voice that addresses their particular ideas and concerns. They are definitely worth supporting. Move over Austin! Garland is on its way to becoming the happening place in Texas! 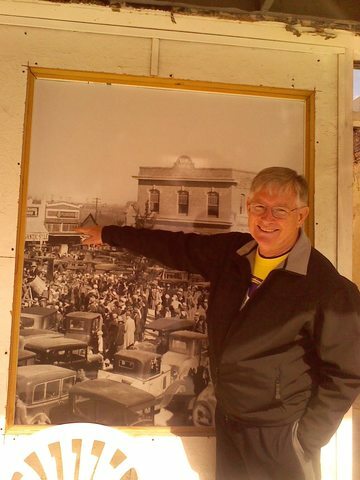 Mayor Doug Athas points to the possible location of a new craft beer brewery, Intrinsic, on the downtown square of Garland. The current, burned out building, like many of the buildings around the square in Garland, has long history. Prior to the fire fifteen years ago that wiped out the interior of this building, it has housed many different types of businesses. It began as a Harness and Tin shop near the beginning of the 20th century. In 1932 plumbing supplies were sold there. The building retains its original parapet [portion of exterior wall that extends above the roof line], one of the few buildings on the square to do so. However, today, due to the fire, the roof is missing and the interior is gutted down to its brick walls and concrete floor. Many folks today have never heard of "tinners" as this is a profession that has long been absent from American life. However, back in the 19th and early 20th century tinware competed successfully with the more traditional pottery products. Tin shop owners shaped tin sheet iron into a variety of forms, and distributed finished goods wholesale through peddlers, and country stores. 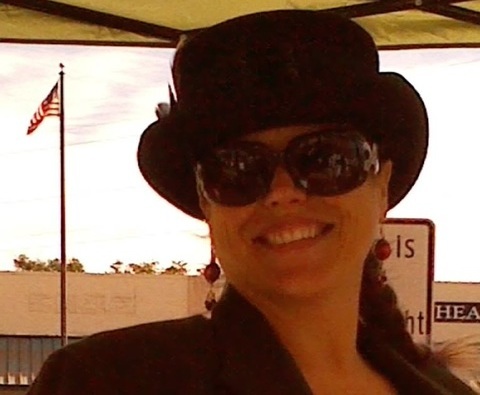 Cary Hodson, a local Garland resident, is raising money to make this happen on an ale-centric crowdfunding site, Crowd Brewed. If the Internet is any indication, Cary has started quite an avalanche of buzz for his project. In fact, his event has caught the eye of the UK press. Texas man offering free beer for life for just $2,000 but you have to invest in his start-up brewery. The Fort Worth band, The Gypsy Playboys offered live tunes yesterday. at the Intrinsic Brewing, Tasting and Food Truck Cafe (in the old burned out tin shop). You can hear this great band at the Mellow Mushroom in Rockwall on Nov 15, Dec 13 and Dec 27. Below you see a view from the inside of the Intrinsic Brewing, Tasting and Food Truck Cafe. 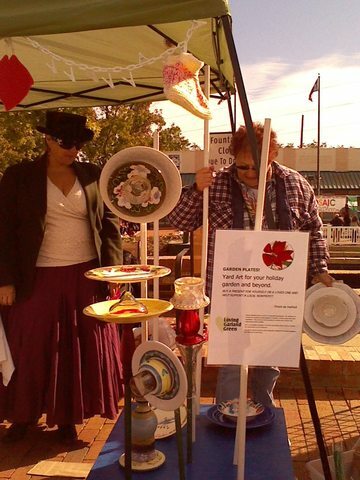 The Intrinsic event wasn't the only happening event in downtown Garland yesterday. The Mistletoe Market was also happening. This event is organized and marketed by Kirk Lovett of Eventive Marketing. Some of the proceeds from the event go to our local Good Samaritans. In addition, residents brought canned goods to help supply the food shelves for this charitable organization in our community. 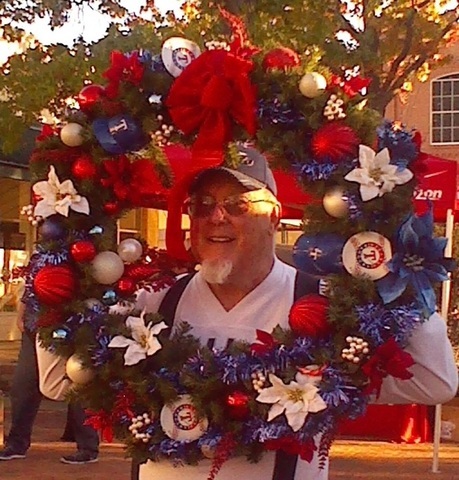 Gene Rodgers, engineer, professional soap maker and all around Renaissance man put himself in charge (Loving Garland Green is a member-directed nonprofit organization) of promoting the sale of our Texas-sized Rangers wreath. Gene did a heck of a job. He even got on the microphone and encouraged a flurry of last minute raffle ticket sales. Thank you Gene! by the way, if you don't know anything about how to make soap and would like to learn, come to the weekly meeting of Loving Garland Green on Monday November 10 from 6:30 to 7:30 at 216 East Kingsbridge Drive Garland 75040. Jean Shortsleeve, another of our members made and donated this wreath for the event. If you are interested in having any type of special wreath created for you, just call Loving Garland Green at 972-571-4497 and we will put you in touch with Jean. It was a beautiful day for meeting and talking with people. I know Austin prides itself on being quirky and artsy and different, but let me ask you: Does Austin have Victoria England? No, Victoria and her husband live in Garland. Instead of mowing their lawn, they have two giant tortoises who do the job for them. People are filled with great ideas for improving our community and making it even more of a great place to live than it already is. For example, I talked to a fireman, an avid gardener, who is interested in getting neighborhood gardens planted in and about our local fire stations. That sounds like a great idea to me. Anything can happen in Garland and it's all mostly good. We still have people living here who not only believe in the American Dream, but who are also willing to work for it. We will all prosper the closer we move to a local plant-based economy and this includes craft breweries, gardens, rain barrels, rainwater harvesting and much more. City leaderships all over the USA are waking up to the potential offered by this new economy and I'm happy to know that I live in one of these cities with that kind of local leadership and citizen participation. Residents of Garland have a deep history of bootstraps optimism. Two of our oldest businesses--Roach Feed and Seed and Resistol--were established in the worst depression our country has ever known, the Great Depression of the 1930's. It is noteworthy that both these businesses have not only survived, they have thrived. Resistol is today the largest hat manufacturer in the world. Then there is the story in our very early history of how no one would sell us electricity so a few citizens bought a generator and established a locally owned electric co-op. Garland is a very cool city and it's time for us who live here to get the word out: We love Garland! Growing Garland Cool means Loving Garland Green. 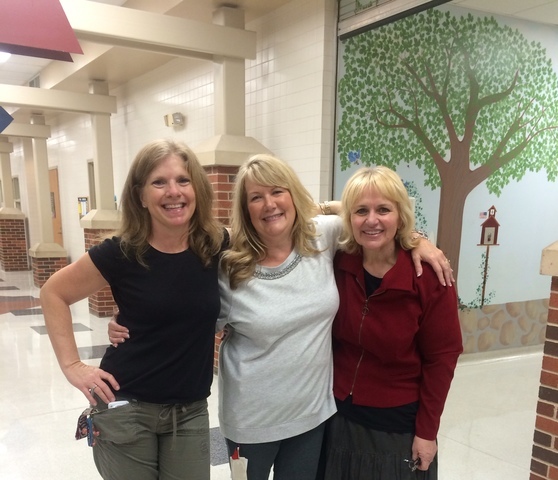 Shelly Mayberry, Michelle Hibbs and Beverly Wardwell, RN, BSN are the faces behind the success of the Jam the Gym Health Fair at the Lister Elementary School in Garland, Texas (November 6, 2014). Thank you for all that you do for the children in our community. 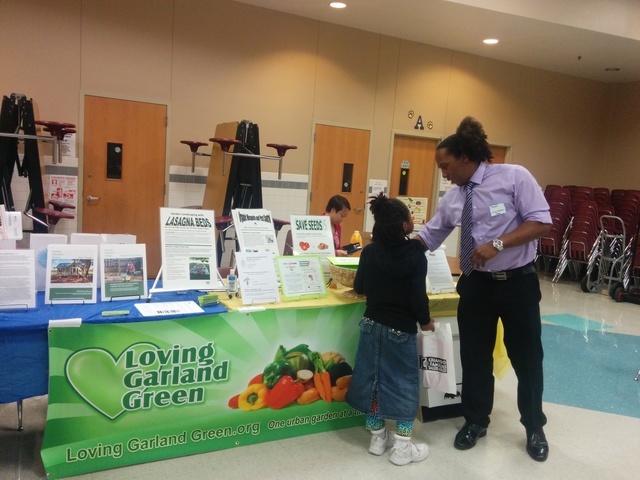 Members of Loving Garland Green had the pleasure of being invited to participate in the "Jam the Gym Health Fair" held on Thursday evening (Nov 6) at the Lister Elementary school. Other vendors represented included the American Heart Association; Baylor School of Dentistry; City of Garland Environmental Waste Re-cycling; Counselor-Bullying, Drug Awareness and Peer Pressure; Garland Health Department; Garland Office of Emergency Management; Lakepointe Bone and Joint, Loving and Logic Parenting Class Information; Medical Center of Plano - blood pressure screenings; North Texas Poison Center; Parkway Dental; Pedia Med Night Clinic; School Resource Officer - Bicycle Safety; and WIC. 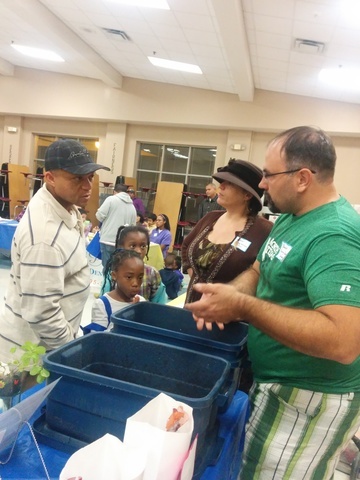 Loving Garland Green member, James Roney talks with a pupil from Lister Elementary about organic pest control. Last night several members of Loving Garland Green and I had the pleasure to participate in the school's Jam the Gym Health Fair. Beverly Wardwell, RN, the school nurse, plays a very active role in teaching the pupils at Lister Elementary how to get healthy and stay healthy. Among other things, she encourages them to eat from the rainbow and include a variety of colorful foods in their diet--from carrots to watermelons; from green beans to beets. She is now teaming up with Michael Floyd, a fifth grade teacher at Lister, to create a garden for the school and teach children how to not only eat food from the rainbow, but to also teach them how to grow the plants. 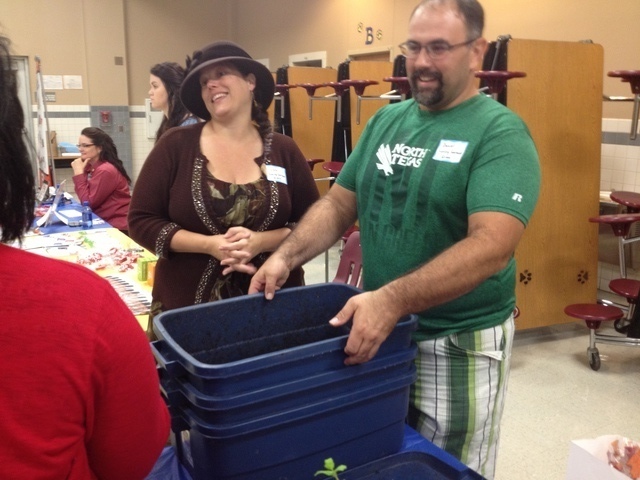 Carol and Daniel, members of Loving Garland Green, brought their worm farm to the event. For the Loving Garland Green table, it was a popularity draw between their worm farm and the popcorn machine that James and his wife Lilly brought and served up free sacks of popcorn from to the kiddos and their parents. Speaking of starting ripples in the community lake, take a good look at this rock. Michael Floyd, fifth grade teacher at Lister Elementary School, began to move and shake things in the right direction last spring. He stuck with it until his school had a greenhouse installed in the back of the school. Pupils in Michael's class were very enthusiastic about the greenhouse, and this year Michael hopes to get even more use from the greenshouse. Last year the installation was completed just as things began to warm up here in Garland. As you may know, greenhouses are great for November, December, January, February and a week or two in March; however, after that. . . .not so much. Michael is already making use of rainwater harvesting. 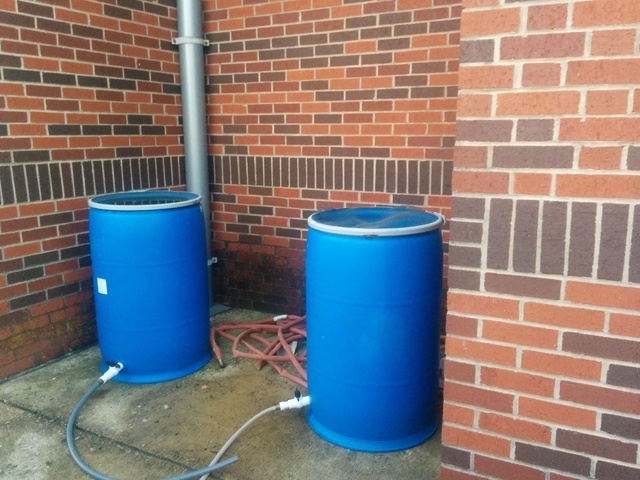 There are three rain barrels that he has set up and are operational: One is connected to the greenhouse and the other two are attached to the gutter system of the school. But if you think Michael's ambitions stop there, you are wrong. He hopes to create a raised garden bed for each grade level at Lister Elementary School so that all the children at Lister can participate in the rewarding and educational experience of gardening. And he is busy working on a grant assist with the project. In the meantime if you have any spare cash or elbow grease, please contact Michael at 214-681-2398. I'm sure he would love to hear from you. Lister is already taking advantage of rainwater harvesting potential from the roof of the school building as shown below. Two rainbarrels are connected to the roof. The greenhouse currently in place at Lister Elementary also harvests rainwater from its roof. Now this is a great way to raise money! You are going to eat dinner anyway on Tuesday, November 18, aren't you? 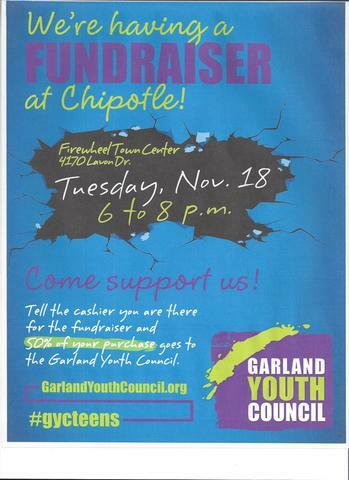 Well, if you eat at Chipotle at the Firewheel Center (4170 Lavon Drive) between 6 and 8 pm on the 18th of November AND if you tell the cashier you are there for the fundraiser, 50% of your purchase goes to the Garland Youth Council. Now who is the Garland Youth Council and what do they do? The mission of the City’s Youth Council is to provide a forum which educates Garland’s youth to the various workings of City business, and allows youth to be a voice to address their particular ideas and concerns. The Council which meets once a month is comprised of 20 members from our community. And what's on the menu at Chipotle? No matter what your unique dietary needs are, Chipotle has options for you. Unless you have an allergy to delicious food, in which case, we might have an issue. Chipotle's menu includes selections for just about every palate. Help the Garland Youth Council and help out a business that is located in Garland. In addition to 50% of the price of your meal going to the Garland Youth Council, 2% of the sales tax applicable to your purchase will also go to the City of Garland since this particular restaurant is located within the City limits of Garland. Lots of things happening in November in Garland! 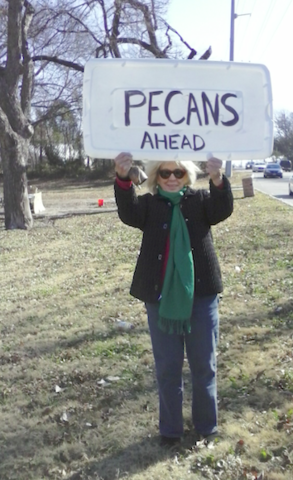 Loving Garland Green has begun our annual pecan sales. This year we have exciting packaging and a new way to market our pecans. This year the pecans are packaged in a cup and promoted as a "Cup of Texas". 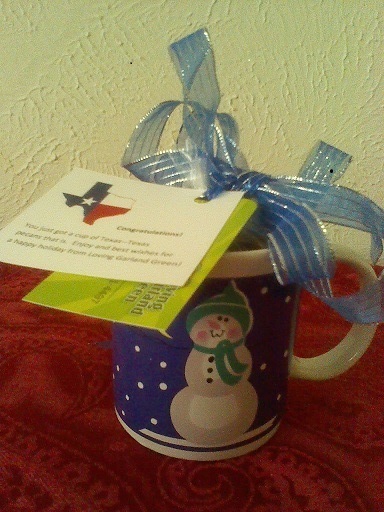 At only $3.00 each, the recipient not only gets a few pecans from Texas, they also get a nice mug they can use for years to come. We have a variety of mugs to choose from--ranging in styles from holiday to garden flowers to plain colors. They make the perfect inexpensive holiday gift. And Loving Garland Green is participating in the event with a booth. Come on to downtown Garland and select from our wide array of holiday gifts--from handmade soaps by Gene to Plate Flower Yard Art by Margie. Help yourself and help your community by shopping local this year. Charlie's tarragon, lavender, and marigolds are going wild. In the photo above you can see the mustard greens holding their own in between yellow and orange marigolds. Yep that's Charlie's broccoli. It actually survived the grasshoppers who, by the way, better look out next year because we've learned all about Nolo. When one gets out and about in the Garland downtown square, there is no end to the amount of connections and magic that can happen. Yesterday, at the Mosaic Festival, was no exception. Just take a look at the connections I made. But I won't let the connections for this event end here. I plan to contact my friends at Bud and Blossom Garden Club, the Heritage Herb Club and the Greater Dallas Organic Garden Club to see if they would like to furnish literature too for this worthy event. Nancy Ghirla, Editor of THE MESSENGER - Furthering Nancy's vision of a Garland Neighborhood Garden across from Roach Feed and Seed right in downtown Garland. I met Nancy--at last! Delores Elder Jones, a mutual friend connected me up with Nancy last spring and I wrote an article for THE MESSENGER about Loving Garland Green. However, until yesterday I had not met Nancy in person. What a treat! In chatting with Nancy I learned that she has the idea that a vacant lot across the street from Roach Feed and Seed would be a great place for a Garland Neighborhood Garden. I agree. I'm hoping this project can be added to Loving Garland Green's Program "Another Neighborhood Garden." In addition to stewarding the Garland Community Garden at 4022 Naaman School Road, Loving Garland Green also has two other programs designed to encourage the growth of gardens in our community: Another Urban Garden and Another Neighborhood Garden. Another Urban Garden is designed for individual Garland residents whereby members assist individual residents in planting gardens at their home. Another Neighborhood Garden is designed to create community gardens at the neighborhood level. For these gardens we begin with securing permission to use city-owned property for a garden. Then we get the word out to interested residents living within a 1.5 mile radius of the location. We believe the closer one lives to a community garden, the more likely they are to participate in its upkeep. I will be talking with Mayor Doug and Felisa Conner from our Neighborhood Vitality group about this project soon. A lot of folks may not know this, but if you get organized at a neighborhood level for projects, there is money available for your projects. If you went to the Garland healthy living expo back in September, you may remember Keep Garland Beautiful’s display of rain barrels. They are absolutely lovely. These rain barrels are fashioned from recycled pickle barrels. Ken and I chatted about a possible partnership whereby we would sell these barrels bearing the Loving Garland Green logo. I’m hoping that next year we can partner with Keep Garland Beautiful on a grant whereby we would be able to furnish rain barrels to our citizens free. In addition, I would like to have the rain barrels involved as part of a rainwater harvesting project that Loving Garland Green currently has under consideration with the Garland Parks and Recreation Department. I made many more informative and feel-good connections at this great community event: I collected a hug from BJ Williams, council member for District 4. Billy, like all our City Council members, supports the Garland Community Garden. He told me that not only has he been down to the garden several times, he has planted veggies down there. Anita Goebel, Council member for District 2 here in Garland, stopped me for a hug. Anita mentioned that she sees me often working in the Garland Community Garden as she drives by. 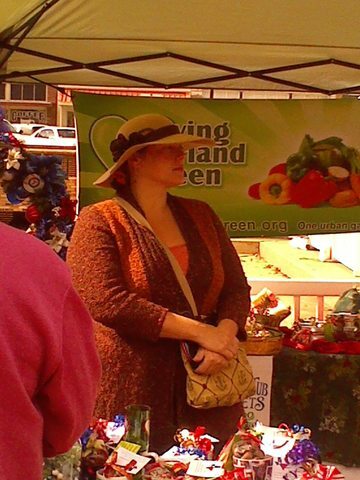 Council woman Goebel is very supportive of urban agricultural events in our city. 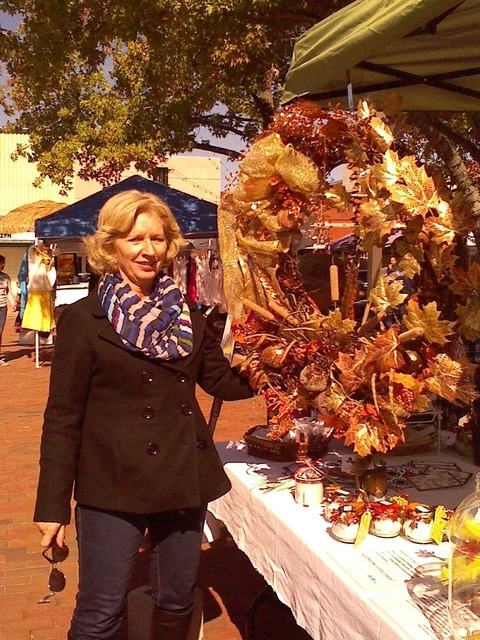 She is among those who worked hard to see the establishment of the Garland Marketplace. And that reminds me: Kirk Lovett, President of Eventive Marketing, the organization who hosts the Garland Marketplace showed up to support the event. 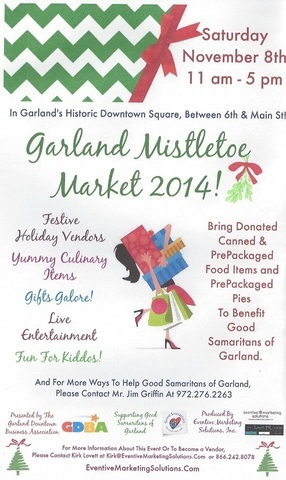 Next week Kirk will be hosting the Garland Mistletoe Festival. A certain amount of the proceeds from his events go to our local charities. 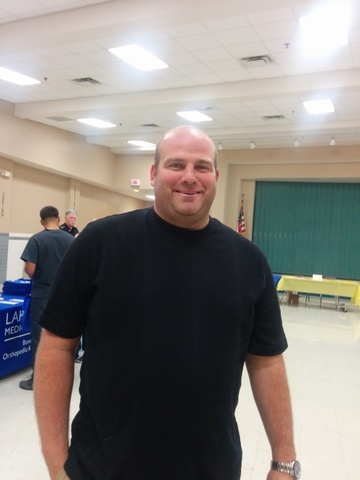 Councilman Scott LeMay was there with a happy smile as usual. I'm sure that all the council members who could made the event. Of course, it goes without saying that our mayor was there. 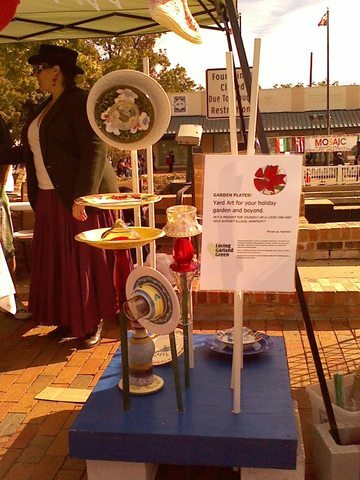 Margie Rodgers, Loving Garland Green Board member and Carol Garrison arrange yard art plate flowers created by Margie for the sale. Note: Life is filled with second chances. 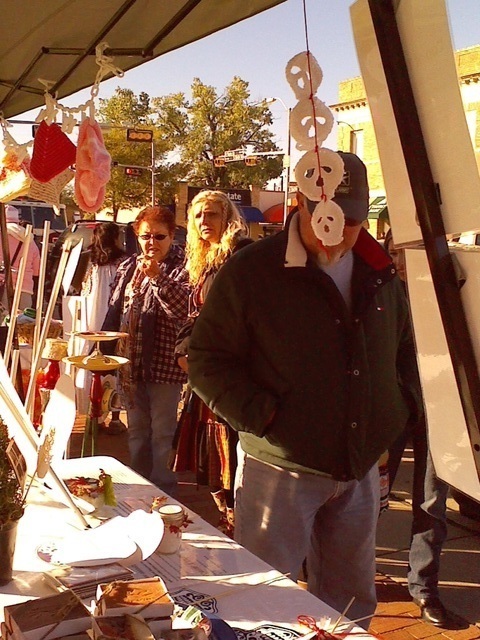 We will be at the Mistletoe Festival on the Garland downtown square on Saturday November 8. This art will be for sale then too! Winner of our wreath raffle. Loving Garland Green member, Jean Shortsleeve, created this beautiful Thanksgiving wreath (Value approximately $50.00) that was raffled off at the Mosaic Festival. Tickets were sold at $2 each. We plan to raffle off a large Christmas wreath at the Mistletoe Festival this coming Saturday as well. Hope you can make it.